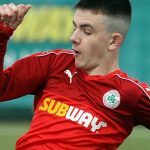 Joe Gormley is now Cliftonville’s all-time leading goalscorer. His opener from the penalty spot in this evening’s North Belfast Derby against Crusaders saw him break a 57-year-old record set when Kevin McGarry netted the last of his 170 goals for the Club in a League encounter with Bangor on March 4, 1961. While McGarry – who smashed the previous landmark of 127 set by Sid Over – amassed his total after 286 appearances for the Reds, Gormley needed just 247 to set his own goalscoring milestone, one which he increased to 172 when he added a second spot-kick later in the game. Joe made his debut in a friendly with The New Saints on June 18, 2011 and, though his injury-time winner at Park Hall doesn’t count towards his tally, his incredible half-volley from the halfway line provided an early glimpse of what was to come in a Red shirt – and was the first of 39 goals he has scored in friendlies, taking his overall unofficial count to 210. 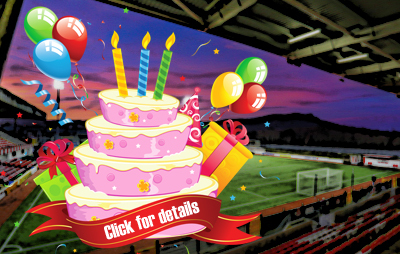 His first competitive outing came somewhat ironically against the same opponents in the Europa League just 12 days later but almost three further months would pass before he opened his scoring account when Ards were defeated on League Cup duty at Solitude on September 20, 2011 – Cliftonville’s 132nd birthday. His maiden Premiership strike came when he put the seal on a 4-1 victory over Dungannon Swifts on October 8, while his habit of last-gasp goals continued in a memorable triumph over the Crues the following month. 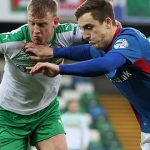 Indeed, the 28-year-old has been no stranger to the scoresheet in North Belfast Derbies, having found the net against Crusaders on no fewer than 17 occasions – more than against any other team. Next up are Ballinamallard United (14), Ards, Ballymena United and Portadown (all 13), with Warrenpoint Town (11) joining Dungannon Swifts, Glenavon and Linfield (all 10) as the sides against whom he has registered double figures. Crusaders have also shipped more Gormley penalties (5) than any other team and are one of eight opponents he has smashed hat-tricks past – with Warrenpoint Town and Institute both having suffered that fate twice. In total, ‘Joe The Goal’ has racked up 34 doubles, including five against Ards, four against Crusaders and three against both Linfield and Ballinamallard United, while his total of 118 Premiership conversions means he’s also Cliftonville’s leading scorer of League goals. After netting 14 times in his first season, his lowest return since then is the 30 he hit during the 2012/13 campaign, with 37 coming the following year, 41 in 2014/15 and, after a spell with Peterborough United, 34 last term in addition to the 16 he has claimed so far this season. 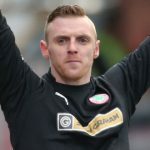 As well as 27 League Cup strikes, 15 in the Irish Cup, six in the County Antrim Shield, three in European Play-Offs and two in the Setanta Sports Cup, Gormley claimed his first ever European goal back in July when Nordsjælland became the 26th different Club that he has found the net against since joining Cliftonville from Crumlin Star just over seven years ago. As well as setting a new Reds record tonight, Joe also achieved the notable distinction of scoring the first ever Premiership goal live on the BBC and maintained the rather unusual statistic of being the only Cliftonville player to have ever found the net in the Club’s new away kit.